First off, I'm a stereo man. 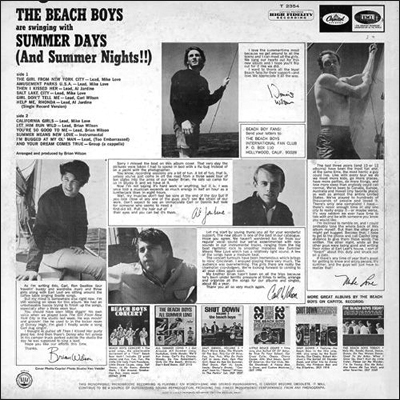 I realise the cultural and historical importance of the mono recordings but I just love that stereo sound on these pre-"Pet Sounds" Beach Boys classics. The mono is perfectly listenable though, powerfully balanced from the centre of your speakers, with crystal clear reproduction. “Then I Kissed Her” is a perfect example. There is a real bass power to the mono recordings that make them definitely worth owning. The classics on here are the obvious ones - the beautiful "Then I Kissed Her"; the singalong "Help Me, Rhonda"; "California Girls", which speaks fot itself and the sometimes overlooked but beautiful "You're So Good To Me". As for the rest, there not as much good stuff on there as on others. “I’m Bugged At My Old Man” is best consigned to history. There was always one dreadful song on each of the early/mid sixties albums, it seemed. "Salt Lake City" is just plain fun, “Amusement Parks USA” has a sort of goofy, fairground in summer appeal and the lovely, harmonious, bassy "Let Him Run Wild" and "Girl Don't Tell Me" are surprisingly mature compositions. "The Girl From New York City" is an upbeat enough opener, with some great vocals, but on the whole this album is pleasant but certainly not essential. By now, yet another album about the joys of a Californian summer was always, of course, going to be pleasurable, but it was a bit like being on holiday and drinking large cokes with ice every day as a kid. After a while it loses its appeal, just a bit. The Beach Boys couldn’t carry on, year in, year out, as the “niche boys”, could they? The needed to diversify away from the beach at some point. Nevertheless, I could listen to “You’re So Good To Me” endlessly. “Summer Means New Love” was a delightful instrumental too. 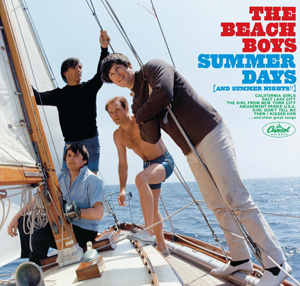 Incidentally, on the cover Brian Wilson looks decidedly uncomfortable on board ship (which apparently he was) and nerdy, while Mike Love looks, as he always did - old.